“Big” Jim, as he is affectionately known has been an integral part of the Canadian sportfishing scene for over 30 years now and shows no signs of slowing down. Having first gained notoriety as a tournament angler, “Big” Jim was vaulted into the sport fishing spotlight with two CFT Canadian Classic Championships… Canada’s premier tournament title along with a slew of tournament victory’s numbering 28 to his credit. 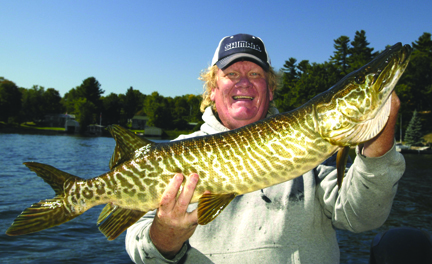 Following his tournament success, “Big” Jim founded what has become Canada’s largest FREE fishing publication – Just Fishing with “Big” Jim McLaughlin. This successful publication is celebrating it’s 25th anniversary of bringing much needed angling information to Canadian and American anglers alike. “Big” Jim also spent several years as the host of the Ultimate Fishing Show before moving on to the current phase of his career which includes tournament weigh-in show Emcee, featured speaker at many of the premier sport shows in Canada, as well as outdoor writing, promotional activities, celebrity guiding and just about anything else connected with the fishing industry… including marketing partnerships with several of the largest and most trusted names in the business… and an association with a long list of charity children’s events. “Big” Jim was presented with the CSIA (Canadian Sportfishing Industry Association) Chairman’s Award in 2008 for his outstanding contributions and dedication to the growth and participation of recreational fishing. Also in 2008, “Big” Jim was named as the first recipient of the CPAA (Canadian Professional Anglers Association) Lifetime Member Award. At the 2009 Spring Fishing & Boat Show “Big” Jim was awarded the Rick Amsbury Hall of Fame Award presented by the Canadian Angler Hall of Fame for going above and beyond the expectations of the angling community. Travelling over 100 days a year, when “Big” Jim is not working on Just Fishing or taking time to introduce a child to the joy of fishing he finds time for the family including his beautiful wife of 35 years Tammy, their three children, 9 grandchildren and not to be left out, 2 very special springer spaniels. Copyright © 2011 Just Fishing. All rights reserved.